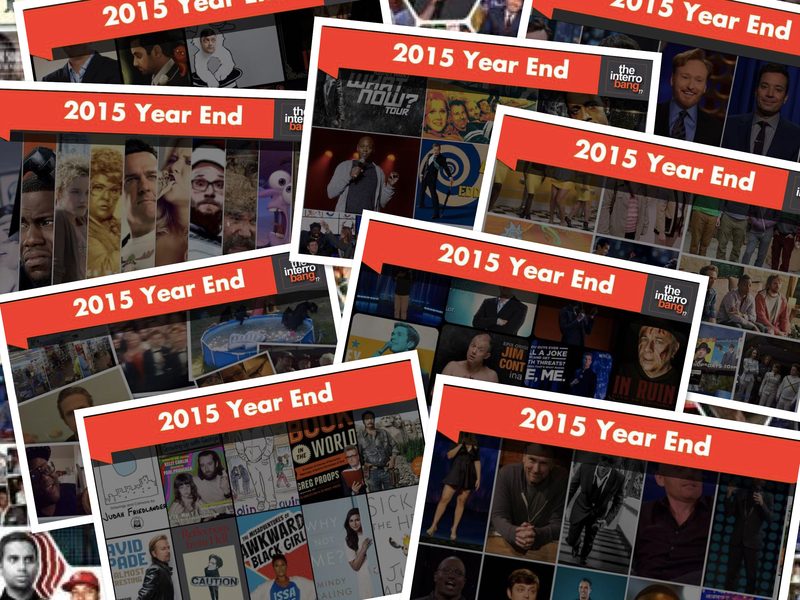 Another year in comedy has come to a close and there’s already a lot to talk about in 2016. But before we move on, we have one last thing to settle and that’s the results of the 2015 Readers Poll to find out the Best of Everything in Comedy 2015. Over 10,000 people voted this year over a period of two weeks in 9 comedy categories. The categories included Stand Up Comedian of the Year, Best Album, Best Special, Best Tour, Best Book Written by a Comedian, Best Comedy Movie, Best Comedy TV Show or Series, Best Animated Comedy Series, and Best Late Night Host. You also voted on Best Viral Video, Biggest News Story that kept comedy writers busy, and Best Moment in Late Night Television. Also don’t miss our picks for Most Innovative Moments in Comedy in 2015 even though we didn’t put it to a vote. 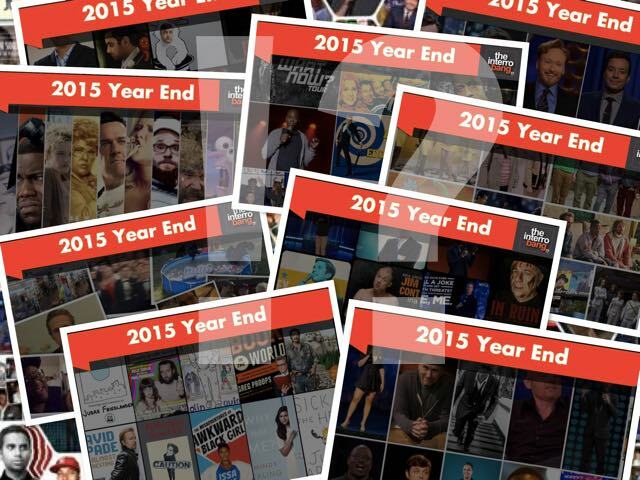 So on to the winners of the best of everything in comedy 2015, voted by you, the readers. BEST VIRAL VIDEO honor goes to Anthony Cumia for his Andrew DICIS Clay video, BIGGEST NEWS STORY belongs to Donald Trump announcing his candidacy, and BEST MOMENT IN LATE NIGHT honors goes to Bob Dylan for his last musical performance on David Letterman. The BEST ANIMATED COMEDY SERIES category was a real battle between multiple contenders, but South Park pulled it together in the end proving that Matt and Trey still got it. A lot of fans and critics are saying the show is having its best season ever. Stone and Parker took the demon “political correctness” on this year and won. The team at South Park continues to point out the absurdity of the world we live in the funniest way possible. In the category of BEST COMEDY SERIES, first time nominee and newcomer The Jim Gaffigan Show grabbed a huge win. The New York centric Jim Gaffigan Show brought edge to TV Land and proved that you can do a family show while still addressing grown up issues. Adam Goldberg and Michael Ian Black co-star as Gaffigan’s buddies, and there are some great comedy guest stars throughout. If you missed season one, catch up quick because there will be a season two coming soon to TV Land. BEST COMEDY MOVIE was another dogfight but it proved impossible for anyone to topple the lead dog, Trainwreck. Amy Schumer had a monster year this year all around, landing magazine covers, photo shoots, red carpets, invites everywhere, a tour, and a special, and Trainwreck was undoubtably the catalyst for making it all happen. Schumer wrote and starred in the movie which was directed by comedy great Judd Apatow. The cast is a comedy supergroup with Colin Quinn stealing all of his scenes as Amy’s ailing father, Bill Hader as the man who could turn Amy’s dating life around, plus Mike Birbiglia, Vanessa Bayer and Dave Attell. Congratulations to Amy on her gigantic year, and on an unbelievable first movie. For the BEST COMEDY BOOK category, we nominated ten books written by comedians. There were some amazing comedy books this year– and you should read all of them. With such great nominees to choose from, it should be no surprise that he winner is a remarkable book, written by a remarkable comedian. Everyone was impressed when Colin Quinn was merely coming out with brand new one-man shows tacking difficult issues and staying smart and funny, but this year he upped the game, writing a terrific book and turning it into another brand new one man show. The Coloring Book discusses cultural stereotypes, particularly in New York City but the issues transcend geography. In the stand up categories, the BEST COMEDY TOUR of the year goes to Undateable, and cast members Chris D’Elia, Brent Morin, Rick Glassman and Ron Funches who went on tour to promote the all-live season of their NBC series. The all-stand up led comedy series also made our list for most innovative moments in comedy this year, for daring to do an all live season on network tv, and adding a social media component to their show that rivals any other series making them the most interactive show on television. Best Comedy Special and Best Comedy Album are always closely tied in with some overlap in nominees. BEST COMEDY SPECIAL was a hotly contested race, but nobody could beat Jim Norton and his new EPIX special “Contextually Inadequate“, which is as topical and fearless as it is funny. In his newest hour, Norton takes on some big scandals like Cosby, the firing of Anthony Cumia from the Opie and Anthony Show, and Sandusky just to name a few. Norton’s social commentary is on point, and in a time when a push for political correctness seems to be in the media on a daily basis, its great to know that comedy fans still prefer their comedy heroes to be uncensored and unapologetic. BEST COMEDY ALBUM went to the ever-hilarious and maybe funnier than ever Jay Mohr, and his wife Nikki Cox, for Mohr’s new Grammy nominated album, “Happy. And A Lot.” Cox wrote the album and special, Mohr performed it, and its some of the funniest recorded comedy this year. Jay proves that comedy doesn’t always have to be angry to be funny. Finally, the STAND UP COMEDIAN OF THE YEAR goes to one of the younger comedians on the list of nominees, Nate Bargatze. Last year Bargatze was mentioned several times by other comedians as the comic most likely to break out in 2015, and now he’s our reader voted Stand Up Comedian of 2015. With two appearances on The Tonight Show, the release of his first hour special and second album, and headlining all over the country including two of the biggest festivals- SXSW and Montreal Just For Laughs, Bargatze is just getting started. His album and special, “Full Time Magic,”— is beloved. Congratulations to Nate Bargatze and all our other winners and nominees. 2015 was an amazing year and we can’t wait to see who kills it in 2016. Scroll down below the graphic to see last years winners and this years winners in a straight list.